Sebastian Vettel has opened up on a "difficult and exhausting" F1 season in which he failed to challenge Lewis Hamilton, with the Ferrari star admitting: "I wasn't at the top of my game." Many had expected Hamilton's battle with Vettel to go down to the wire following Ferrari's strong start to the year. 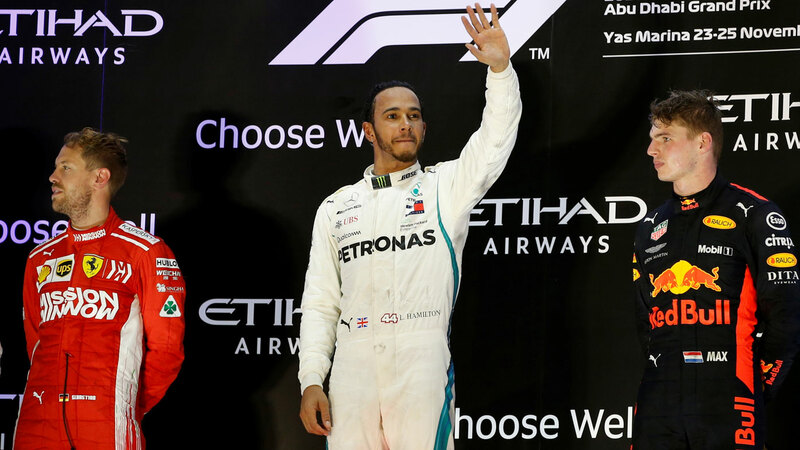 But the German fell away after a series of mistakes, and finished the campaign an eye-watering 88 points adrift of Hamilton and with just one win since the summer break, at the Belgian Grand Prix in August. The rivals traded crash helmets after Sunday's final race, the Abu Dhabi Grand Prix, with Vettel saying to Hamilton after the Briton's victory: "Five championships is a great achievement, but I hope I stop you from getting more." Vettel, a four-time champion, later added: "I am looking forward to turning everything off. I need some time for myself. It has been quite a difficult and exhausting year for me, and I definitely need a bit of a gap until next season. "I don't think I ever had any problems raising my hand if I made a mistake, so I have to review a couple of things that went wrong. Here and there, I wasn't at the top of my game, so I have to look at myself. I can be better than I was at times this year." Hamilton will collect his championship trophy at the FIA's prize-giving ceremony in St Petersburg, Russia, a week on Friday. Vettel said Ferrari had lost its way during its challenge to dominant outfit Mercedes. “We lost our path a little bit halfway through the year. Things didn’t come together so obviously we did a step back towards the end of the year which enabled us to be more competitive again but I think we’ve understood what went wrong,” he told Sky F1. “We had a lot of lessons, it was a tough year in general. I think the team is strong and the team has potential. “The passing of our chairman, Mr Marchionne obviously had an impact and was tough so I think it’s up to us to look into every single detail and make sure we come out as a stronger group, enabling us to build a stronger package for next year and for the future. “Towards the end, we were lacking a bit of everything and then one thing led to another. If we had the speed, you start from a different place and you are out of trouble. As a matter of fact, we didn’t have that speed. “The gap is quite a big. Yes, we could have been closer. But being realistic, in none of the final races could we put the car on pole and lead the race in our style. Ultimately, we were not quick enough. Meanwhile, Hamilton says he expects Max Verstappen to be in the thick of next season's Formula 1 championship fight. Hamilton won the 11th grand prix of his title-winning campaign with a dominant performance at the final race in Abu Dhabi on Sunday, and celebrated by going backstage at a Guns N' Roses concert. The Mercedes star, 33, will be heading to his traditional winter training base in Colorado from where he will take stock of a remarkable season which took him to within two titles of Michael Schumacher's record seven haul. Vettel, who Hamilton beat to the championship with two rounds to spare, will be among his rivals again in 2019, while the Briton has also backed Verstappen to feature prominently. The Red Bull driver endured an error-prone start to this year, but ended it impressively, scoring five consecutive podiums, finishing third at the Yas Marina circuit ahead of Australian teammate Daniel Ricciardo, who is departing for before making the switch to Renault in 2019. "Max has been driving very well throughout the year," said Hamilton. "He has shown his consistency this year, and he's been up here many times with us. If his team do the job and delivers a platform so he can compete even closer with us, then of course he'll be in the fight next year."